During childhood, the brain gets "wired up." During adolescence, the frontal lobe undergoes a surge of development. As an adult, the most important trait of the brain is its plasticity. Plasticity is the ability of the brain to adapt in response to new experiences. As an adult, there are often a limitless number of new things to contend with new jobs, marriage, children, financial responsibilities, new friends, etc. New findings on the adult brain establish two principles. First, the adult brain continues to grow and develop throughout our entire life. Second, brain development in adulthood is shaped mostly by outside stimuli. Often, people think of childhood and young adulthood as a time of brain growth – the young person constantly learns new things, embarks on new adventures, and shows an inquisitive and explorative spirit. Conversely, older adulthood is often seen as a time of cognitive decline, with people becoming more forgetful, less inclined to seek new experiences, more “set in their ways”." But what recent research has shown is that under the right circumstances, the power of brain plasticity can help adult minds grow. Although certain brain machinery tends to decline with age, there are steps people can take to tap into plasticity and reinvigorate that machinery. We just have to keep our brains fit with a series of targeted brain plasticity exercises. People suffering from a variety of cognitive conditions may be able to retrain their brains to healthier function. The key – and the challenge – lies in identifying what brain mechanisms to target, and how to exercise them effectively. From early stages of adolescence into adulthood, the brain experiences major growth and pruning. Initial developments begin near the back of the cortex, and tend to finish in the frontal areas. The Mid-Brain is the center of all the miracles in human life. The pineal gland which is a part of the Mid-Brain can be stimulated and hence improve the capability of human brain thousand folds. Since the midbrain is responsible for communication with the left and right hemispheres of the brain, the process of "stimulating" the midbrain will result in better communication with the left and right hemispheres allowing us to use our brain more efficiently and therefore improving one’s cognitive abilities. 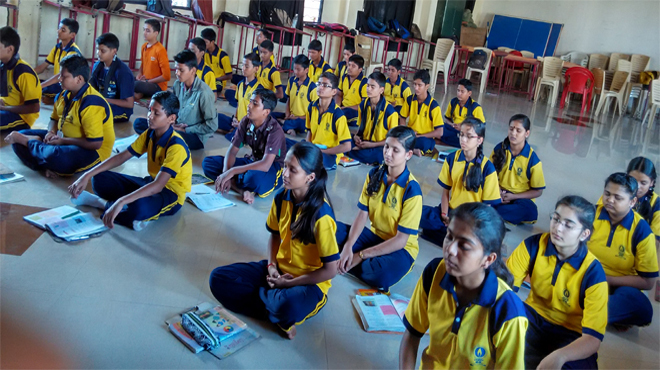 In the Teenagers & Adult Mid-Brain Activation Workshop, we enable to stimulate the Midbrain with targeted brain plasticity exercises alike meditation, brain yoga that boost up your energy levels in your body to promote overall circulatory wellness. Unfortunately, many people are exposed to things that may have a detrimental impact on the development of their brain. These include negative social influences, substance abuse, and/or prolonged levels of high stress. Although some people will have more resilient brains than others as a result of genetics, it is recommended to minimize exposure to problematic stimuli and scenarios. For example – Chronic stress, Poor diet, Relationship troubles, Sleep problems and Social isolation. Drinking excessive amounts of alcohol to the point of abuse may have an impact on the developing brain. It is critical to avoid abusing alcohol while the brain is still developing as excess drinking can disrupt formation of the prefrontal cortex. Some reports have gone as far as to suggest alcohol damages the brains of teens. What are the benefits of Midbrain Activation? Midbrain is responsible for many critical functions.. The ability to focus on one thing, while ignoring distractions is a function of our prefrontal cortex. Those with attentional deficits (e.g. ADHD) may have abnormalities within the prefrontal region. Similarly, those who abuse drugs and/or alcohol may end up with attention problems as the brain forms. The prefrontal region is responsible for complex planning. Anytime you set a goal that requires some degree of planning, your prefrontal region is at work. Planning out tasks in your day, developing a business plan, etc. – this region is responsible. An underdeveloped prefrontal region means that your planning capabilities haven’t been solidified. We often struggle to make good decisions when we are teenagers, but as we enter our 20s, our decision making improves. This is due to the fact that our prefrontal cortex helps us think logically and make more calculated assessments of situations. Our brain weighs the risks and tells us whether a certain behavior or choice is a good idea vs. a bad one. Struggling with impulsivity is often related to deficits in the prefrontal cortex. The ability to maintain self-discipline and avoid impulsive behaviors hasn’t reached its peak until the 20s. This means that if you struggle with impulsivity when you’re 18, it may get better as you continue to age. Justifying behaviors based off of emotions rather than logic is common among teens. When the prefrontal cortex fully develops, logical thinking simultaneously improves. This means you will be better at rationalizing and making smarter choices. It also means that your ability to write and solve math problems will improve. Organizing your thinking can be difficult when you’re a teen. A barrage of thoughts is typically influenced by hormones and you may have concentration difficulties. As you continue to age and your thoughts become more organized. The organization of your thoughts is a result of your prefrontal cortex. Your personality is directly expressed based off of ?? your prefrontal cortex. Without proper stimulation, you may struggle with identity issues and developing a favorable personality. Since personality development continues throughout the 20s, you may want to consider how environmental inputs may affect who you are. The ability to assess risky situations and determine whether they will result in long-term benefit is a byproduct of your prefrontal cortex. Those who are poor at assessing risk may have underdeveloped prefrontal regions. The ability to turn down immediate gratification for long-term rewards is a result of this region. Your short-term memory function is influenced by the prefrontal cortex. When still in development, your short-term memory isn’t as good as it will be by the time you’re 25. As the brain continues to mature, your cognitive function and memorization capacity will improve. What are the immediate benefits of teenagers & adult midbrain activation? Extraordinary increased in virtual capacity to manage day to day stress. Ability to consciously access and assess meta-physical modality stored in the realms of the subconscious. Significant improvements in intuition, instincts, sensing ability and degree of clairvoyance. Significantly improve the quality performance and results in anything you do. Opens more doors to the unlimited inner-skills and inner-self empowerment. More fluent to connect to the divine intelligence. Precognition: The ability to sense events before they occur. Now, you can learn Midbrain Activation (children), Midbrain Activation (Adult), Quantum Speed Reading, Quantum Reading by online anywhere.